The excitement is building... the cruise is only 3 days away and I only have two days left of work! I cant help but remember the last time the five of us were on a vacation together. It was one of my favorites. We road tripped to Oregon to spend a week at our Uncle Danny's. It was a house he had built himself. We picked cherries off the trees, swam in a cold mountain stream, we bailed hay and saw a christmas tree farm first hand. This trip was years ago... so how do I remember it so well? My aunt made us spend a little time each day journaling. I thought it was more fun to draw pictures of what we did than really write about it but those pictrues till make me remember. While i dont have that journal at the moment to show you some pictures, I do still have it. 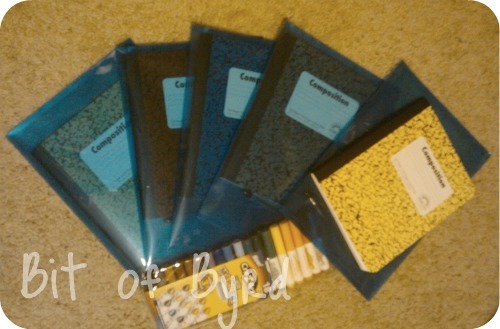 Each plastic packet has a composition journal (harriet the spy style) and a pen. I also bought a pack of mini markers. There is a pack for the journal to be stored but also to place anything else from the cruise you want to keep... flyers, brochures, ticket stubs... anything you want really. So while I dont want to be a journal tyrant... I hope that you can see the value of the journal for the future of remembering the cruise and you will want to participate willingly. Does anyone else have their road trip journal? Or readers... do you have a journal from a trip that takes you time traveling?